At least they're not lonely. Part of what makes the Sims 4 community so vibrant are the challenges people come up with—or as I like to call them, fun excuses to be disturbingly morbid without any guilt. Since Vampire: The Masquerade — Bloodlines 2 was announced, I’ve had vampires on my brain a lot, and I realized that I haven’t really explored the Sims 4 Vampires game pack. So when I came across the vampire challenge I decided to give it a shot. The challenge is to create a vampire legacy, beginning with one vampire and one young adult human (that serves as their personal snack machine) living in the same house. 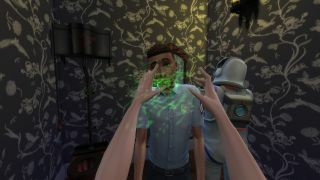 When that human become an elder (and if you haven't turned them into a vampire), they must be replaced by a new, young adult sim. The goal is to grow your vampire bloodline over five (human) generations. So, challenge accepted. I made my vampire sim, got my on-tap food source, and then it all went to hell. But I don’t blame myself for what happened. I'm the kind of person who likes to stick to the rules. But Ruth, the character I created just for this challenge? Her anger issues (she had the hot-headed trait) made that impossible. As soon as I moved into a two-bedroom house in Windenburg, that's when the problems started. Ruth was always grumpy. Sure, it had ugly furniture and sterile walls, and the mattress was lumpy, but what did she expect to get on a broke-budget? I had to spend what little money I had on putting a sink in the kitchen, because the home inexplicably came with everything but the kitchen sink. The crappy decor was one thing, but I wasn't going live life as a colloquialism. Anyway, the first few days in Windenburg weren’t the greatest. The welcome wagon ate all the fruitcake they brought as a gift. I got Ruth fired from her job as an office assistant for turning some cooked accounting books into the authorities. I also got her into a fight with a high-ranking celebrity at a rave in the woods while she was still naked after skinny dipping in the pond. Then, Ruth (I'm not taking the blame for this one) accidentally started a kitchen fire trying to make grilled cheese and the insurance payout wasn’t enough to get a new stove. Then the electric company shut off the power because I forgot to pay the electricity bill. At this point, I start to realize that my quest to turn her into a vampire so I can start this challenge isn't going so well. I spent all the household money on vampire tomes, but didn't leave enough for her to buy the ultimate vampire tome, which was over 1,000 Simoleons, let alone money for food. So, I forced Ruth to take up backyard gardening and sell everything she grew. The romance ended up going well. I gave Caleb keys to Ruth's place so he could come and go as he pleased. He was sweet and attentive to her. After getting their friendship and romance levels to 100 percent, I maxed out Ruth's vampire skill with the last tome, and then asked Caleb to turn her into a vampire. Maybe this is just a fluke, I thought. I tried again the next night. He said no again. I tried again the following night. Still no. I asked Caleb to woohoo, and he said yes. I think Ruth sensed my frustration because after they woohooed, she walked into the kitchen, made some pancakes, and threw a tantrum mid-meal, stomping her feet until she calmed down and finished her breakfast. Both Ruth and I had enough of Caleb at that point, so I had her pay a visit to the oldest vampire in Forgotten Hollow, Vladislaus Straud, who turned her into a vampire. No questions asked! For the first time since moving to Windenburg, I was happy and Ruth was happy. After forcing Vlad out of his home to live with Caleb’s sister, Lilith (even though the two hated each other), I had Ruth marry Caleb and move into Vlad's empty mansion. I needed Vlad's house for the basement, because that's where my human blood bank was going to live. Now that I had my vampire, I needed to get step two of the challenge. I immediately started renovations on the basement: a bathroom, a bed, a refrigerator but no stove (only a microwave), and definitely no electronic entertainment of any kind. Ruth's food source couldn’t have any way of contacting the outside world. But no one wanted to come over and hang out. The naked fight Ruth got into weeks ago with that celebrity was still tarnishing her image. But her husband was a good vampire. Everyone loved him. So, I had Caleb invite some people over. The fruitcake stealing welcome wagon. The celebrity she beat the crap out of. Bob Pancakes. (Realistically, Bob never did anything to Ruth to make her hate him. She just hated his stupid name.) As I was deciding which person I wanted to trap in the basement, all the guest sims eventually found their way down there on their own. Probably because of the refrigerator. The sims always go to the nearest refrigerator. I sensed an opportunity to throw the rules out the window. I built a double door system so no one would be able to escape and locked both doors, with Ruth holding the only key. (Not even her husband had access.) Even if they somehow made it past the first door, they’d still be stuck, forced to play chess and eat peas forever. The party eventually ended. The top right corner of my screen flooded with notifications of all those sims saying goodbye. I grinned to myself as they tried to leave, stomping their feet and waving their arms to let me that they couldn't get out. What about their families? Their jobs? Their kids? Meanwhile, Caleb was none the wiser. He happily sipped on plasma packs from the refrigerator upstairs as I let Ruth roam free in the basement, draining everyone one by one until they passed out. I still have a ways to go to make Ruth a master vampire, but now that I have all these people in my basement (and have utterly failed this challenge), do I ever let them leave?